If weather predictions are accurate, get ready to experience sub-zero temperatures in some places this winter, something that could wreak havoc on garden flowers and plants. However, there are still a number of ways you can enjoy your garden, even as temperatures plummet. Here are some tips on how to make the most out of your garden this winter. An outdoor heater is a useful accessory that will keep you and your family warm during the cold months. These can be professionally installed on the exterior of your home. Alternatively, portable heaters will provide you with warmth when you need it the most. Many retailers sell garden accessories like outdoor heaters and you could save money on tools and other items, which are sometimes cheaper than in the spring. Use a discount code to save even more money on your purchase. Winter is characterised by dark, gloomy nights. However, outdoor lights will allow you to enjoy your garden space, even in dark weather. These lights come in various shapes and sizes, and will either be battery-operated or powered by your mains electricity. When you open a credit account with a catalogue retailer, you can pay for your outdoor lights in installments, which might help you budget more effectively. You can open a new personal account from retailers like Very, Argos and Next online or over the phone. Fire pits are another way to keep warm if you want to spend time in your garden this winter. These allow you to watch fiery flames flicker and illuminate your exterior space. Why not set up tables and chairs around your fire pit and provide your guests with a place to relax? Many catalog brands specialize in garden items like fire pits, and you can spread the cost of your order and pay in installments. If you are interested in some fire pits, gardenflame is a great place to find out some more information on the different fire pits available. I bought a propane firepit for my front porch. It's so pretty. I picture myself drinking spiced wine and watching snow fall. Thanks for these tips. Might come in handy for us pretty soon! I feel bad bc we kind of give up on our compost in the winter bc it's so inconvenient. 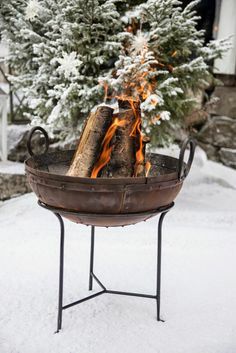 I should use my fire pit more!